What do you do when the enemy is in your head? Not metaphorically — actually, physically in your head and manipulating your reactions to the world around you? When your free will is compromised, how far should others go to stop you? These are a few of the questions David Walton explores in his latest novel, The Genius Plague. Paul, a mycologist, arrives home from a mushroom specimen-collecting trip in the Amazon with a raging fungal infection in his lungs. After he recovers, he finds that he is dramatically more intelligent than before and has acquired near perfect recall. His younger brother Neil has just landed a job working for the NSA as part of a team that handles "undecipherables," coded messages that other teams can't crack. Through one of the transmissions, Neil discovers that an isolated and technologically simple indigenous group of several hundred in Brazil has suddenly taken to modern technology and is coordinating with other groups in Peru and Venezuela. Then, the political situation in South America explodes with coups and military betrayals. It's a race to see who will win and if they will even be themselves when do, as Neil realizes the fungal infections are the common factor in what's happening. I loved most of the characters in this book. Neil is delightfully disaster prone and often too clever for his own good. Wait til you read about his NSA training. (Bahaha!) Melody Muniz, otherwise known as "The Major," is practically a force of nature. She worked hard to get where she is and suffers no fools, but is fiercely protective of the folks like Neil who work for her. Neil's Alzheimer's-ridden father was a perfect supporting character. The scene where he is reading Flower's for Algernon with tears rolling down his face put tears in my eyes too. The only one I didn't really connect with was Paul, but I imagine that was likely by design — it's a bit hard to relate to a character who has become monomaniacal. One of the things that David Walton excels at is putting his characters in difficult moral and philosophical dilemmas. In The Genius Plague, characters and readers must grapple with questions of free will and identity. When someone's will is no longer their own and is behaving dangerously, what counter-measures are appropriate? Does that answer change if the problem becomes large-scale? What are consciousness and identity anyway? Are we more than the sum of our memories and sum of our actions? These kind of deep questions are my favorite part of good science fiction, and Walton always delivers. The only down side to this book for me was some unevenness in the pacing. Although Walton does amazing character development in the beginning of the novel, the middle third of The Genius Plague went slowly for me. The story was a little too straightfoward throughout that part of the book, and I kept waiting for a twist to the story. When it finally came, though, my stomach lurched like I was on a roller coaster! One thing is for sure. 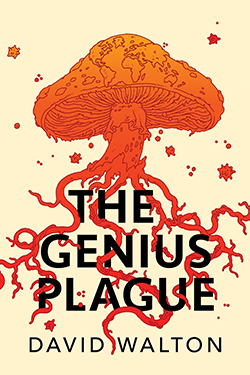 After reading The Genius Plague, the next time I go shopping I will definitely be giving the mushrooms in the produce department the side-eye! Final note: I so desperately wanted there to be an inappropriately timed "It's the fungus among us!" joke in this book. Neil Johns has just started his dream job as a code breaker in the NSA when his brother, Paul, a mycologist, goes missing on a trip to collect samples in the Amazon jungle. Paul returns with a gap in his memory and a fungal infection that almost kills him. But once he recuperates, he has enhanced communication, memory, and pattern recognition. Meanwhile, something is happening in South America; others, like Paul, have also fallen ill and recovered with abilities they didn't have before. But that's not the only pattern--the survivors, from entire remote Brazilian tribes to American tourists, all seem to be working toward a common, and deadly, goal. Neil soon uncovers a secret, and unexplained alliance between governments that have traditionally been enemies while Paul is becomes increasingly secretive and erratic.